1-24 of 332,382 results for "star wars"
Vintage Star Wars 1978 DT Luke Skywalker RARE 12A Back CAS 75+ Mint Amazing!! 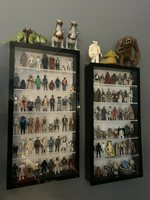 Entire First Run Of Star Wars Action Figures And Creatures. 1977-1985 Complete ! Rare Original ( UNPUNCHED ) 1977 Star Wars Action Figure Toy Fair Display Sign !